Back in the July issue of Loddon Reach, the monthly article about Spencers Wood Football Team whose supporters had raised £1800 for the club prompted me to look up their website. I was amazed to see so many teams featured there unlike in 1919 and 1922 when Spencers Wood had only one team. 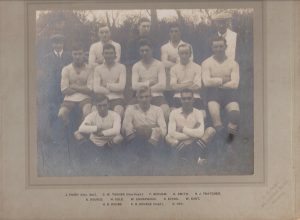 The team in 1922 consisted of C W Turner, who was vice-captain, F Benham, G Smith, H J Thatcher, S Double, H Cole, W Underwood, R Evans, W East, H S House, C E Double (Captain), and Geoff Day. The Secretary was Jack Povey. Jack Povey features in our new book in the chapter on the United Reformed Church when it was the Congregational Chapel. 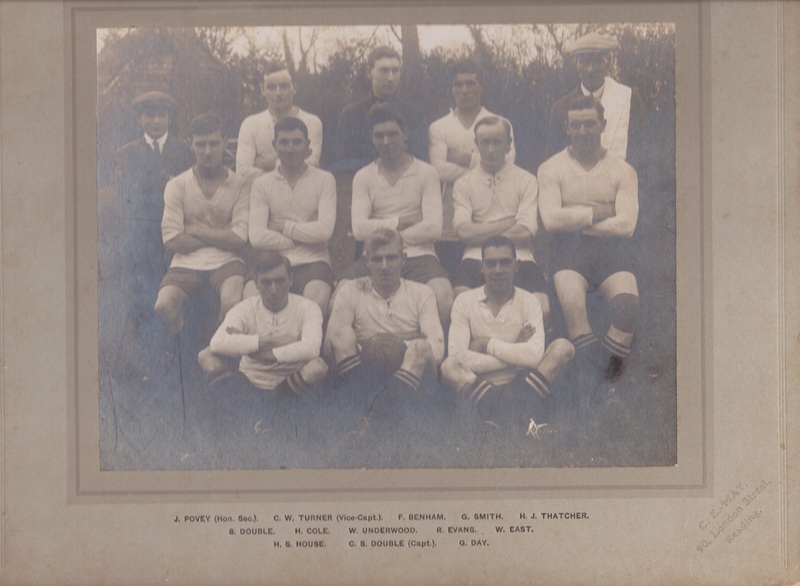 The second photograph features practically the same team except for H S House who is replaced with P Double instead. This team in 1919, were visiting Brock Barracks in Oxford Road, Reading, home of the Berkshire Regiment, to play against the soldiers there and they are pictured placing a wreath on the memorial for World War I just inside the gate arch. Some members of the team lost a family member as a J T Double and E Benham died in the Great War and are commemorated on the board that stands outside St Michael’s and All Angels Church. This board used to be displayed inside and later on, outside the Chapel. H Cole may well have been a relative of the Reverend Cole from the Chapel also. 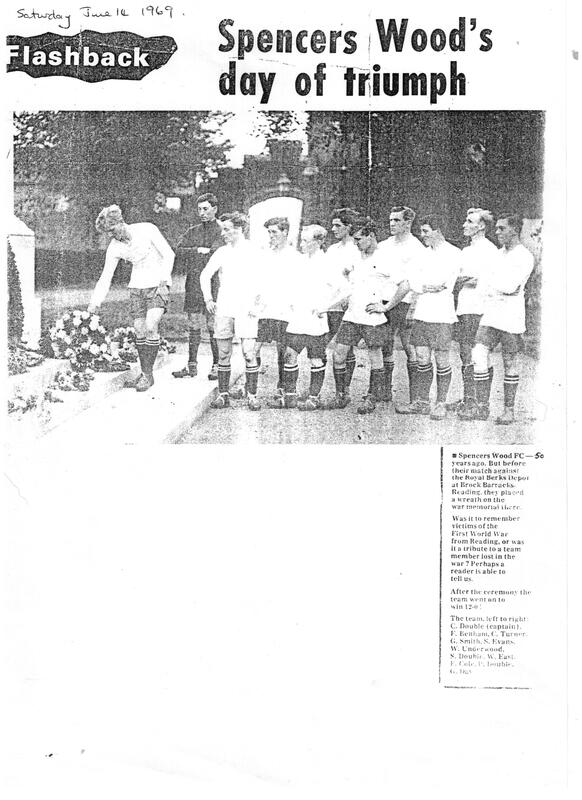 The 1922 photograph, was given to us by Sam Poulter who married into the Double family and the 1919 photograph was in the local paper in 1969, fifty years later. The article about the Day and Marcham family has prompted a response from another member of the Day family which we can add to our memories file.